Who can use this Design and Build Contract? Any property developer, company, organisation or individual embarking on a commercial or residential development. What is this design and build contract for? It is a concise and comprehensive contract for appointing a contractor to design and build the development. This could be an office building, a block of flats or an industrial project. 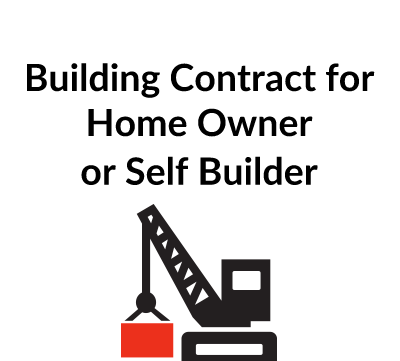 What are the main issues for a design build contract? There are similar to most building contracts. But with a design and build contract, the contractor takes on most of the risk, especially when the contract is for a fixed price. The contractor should be careful to inspect the site before taking on this type of contract. If there are unforeseen conditions, they can cause delay and extra cost which in many cases will not be recoverable, although this will depend on the wording of the contract. When the client wants a change, the contract should have a clear procedure so that the change does not start until the cost and time implications have been agreed. Similarly, if the contractor is delayed or incurs extra costs which is not the contractor’s fault, the contract needs to have a procedure for allowing the claim to be considered and, when appropriate, an extension of time and/or extra cost will be awarded. What detailed terms does the design & build contract contain? ContractStore supplies templates and is not a law firm. All our templates are written by experienced lawyers, in this case by a specialist construction lawyer. So, we can arrange legal assistance for customers who need special terms in one of our documents or a bespoke template. For more information see our Legal Services page. This Contract is for use when a developer appoints a contractor to design and build a property, whether a house or commercial building. Although a fairly balanced document, it is written from the employer’s or owner’s point of view rather than that of the contractor. It contains similar provisions for some of the standard forms which are written for major design-build projects, but it is in a shorter, more concise and easily readable style. The document consists of a one page Form of Agreement, a set of Terms and Conditions plus an Appendix and Schedules setting out the scope of the work and the payment terms. 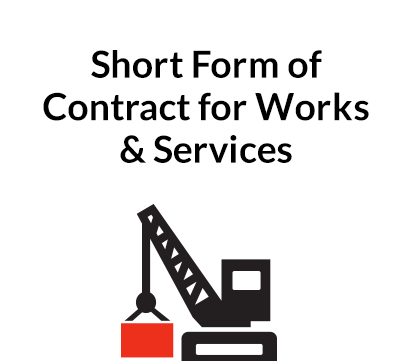 The Form of Agreement is quite short and sets out the basic agreement that the employer engages the contractor to carry out the work for the agreed contract price. The Form of Agreement contains an optional clause which would allow the employer to require some security, either in the form of a parent company guarantee, performance bond (or an advance payment guarantee, if there is an advance payment). 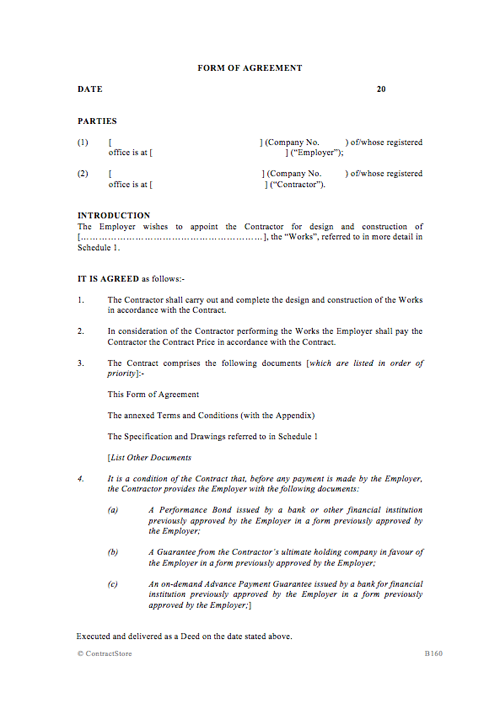 This contains a list of the defined terms in the contract. This contains a number of specific obligations for the contractor which are designed to ensure that the work is carried out efficiently. Clause 2.6 assumes that the contractor will be appointed as Principality Contractor under the CDM Regulations unless otherwise stated in the Appendix. Design of the works is the responsibility of the contractor. This clause sets out the procedure to be followed, in particular the requirement that drawings and details are submitted to the employer for review. The employer will normally appoint a project manager who is authorised to issue instructions to the contractor. The contractor is required to have a including a site manager approved by the Employer. Although not stated in the contract, if the employer wants to keep control, in particular of pricing and programme, he should ensure that the project manager obtains his approval before clearing any change with the contractor. The contractor confirms that he has inspected the site and is satisfied that he can perform the work under the conditions which are likely to apply. One of the main risks for a construction project is that the contractor will find subsoil conditions that were not foreseen. This is dealt with in clause 5.4 and the test is whether an experienced contractor would have foreseen the risk. If not, then the contractor may be given extra time and/or money. Sometimes the entire risk is placed on the contractor but when the employer is reasonably certain that her that the subsoil conditions are known, it is probably cheaper for him to have a clause such as this rather than for the contractor to price a risk which does not then emanate. As goods and materials will be included, this clause makes it clear that once a payment has been made for any goods that are to be incorporated in the work, ownership in those goods passes to the employer, although the risk remains with the contractor until completion. Some projects involve plant and equipment which need to be tested either while they being manufactured or on site. This clause allows the employer to have access to tests. The contractor is required to give a full indemnity to the employer so as to protect the employer against any loss or claims which arise because of some act or omission of the contractor. Insurance will to some extent cover the contractor against these risks and this clause refers to the insurances which need to be maintained by the contractor. There is also potential for a limit on the contractor’s overall liability: if so, the amount will be stated in the Appendix. The limit is subject to certain exclusions including death or injury (where liability is unlimited as required by English law) and where the liability is covered by the Contractor’s insurances. The contractor has to complete the work by the completion date specified in the contract. Before completion he is required to notify the employer who will then arrange for the work to be inspected and, if he is satisfied, a certificate of practical completion will be issued. If the contractor does not complete on time, he may be liable for liquidated damages at a daily or weekly amount as specified in the appendix. There will then be a Defects Period, usually for 12 months from completion, during which the contractor has both the right and the obligation to go back to the site to remedy any problems. Although not stated in the contract, under English law, any latent defects which appear after the end of the defects period could still be the responsibility of the contractor. If the contract is signed as a deed, the liability period is 12 years from completion but if it is not signed as a deed, the normal limitation period is six years. 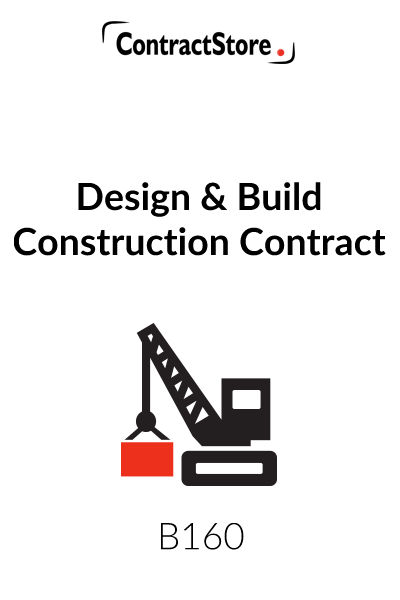 The contract contemplates that there will be a payment schedule with a pre-agreed amount becoming due once each stage of the work is completed by the contractor. 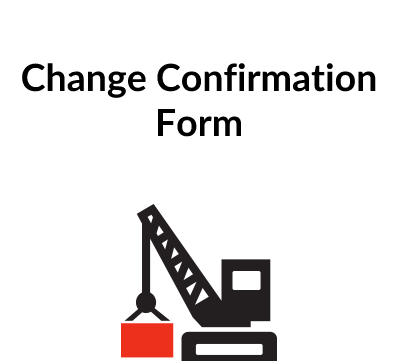 There is also alternative wording so that if there is no payment schedule, the contractor will submit a payment application on a monthly basis. The employer will certify the amount payable and the contractor will then get paid after an agreed period, 28 days in this clause. The clause does allow for a retention, usually 3% of each payment, but where a payment schedule is used, this is normally unnecessary since the amount of each payment in the schedule can be fixed to take account of what would otherwise be a retention. The wording in the payment clause takes account of the construction legislation in the UK which requires an employer to give notice and reasons before paying less than the amount applied for by the contractor. In the case of late payment, interest will be payable and we have inserted the statutory rate although a lower rate might be specified in the appendix. The statutory rate is 8% above Bank of England base rate. If the employer wants to change any of the work or issue any instruction to the contractor, this clause sets out the procedure. First, the instruction has to be given in writing and then the contractor has five working days in which to say whether or not this will affect the price and programme for the work. The employer can then withdraw the instruction or else confirm it, probably after some negotiation the contractor. Circumstances can arise when the contractor is delayed through no fault of his own. In that situation he must give notice to the employer and he may then be given an extension of time with a change in the completion date. Whether or not he will also get any extra cost is a matter for the employer to decide. Under the termination clause, the employer has the right to terminate at any time on giving 30 days’ notice to the contractor. He can also terminate if the contractor commits a breach of contract and the contractor can terminate if the employer is more than 60 days late in making any payment. Either party can terminate because of the other’s liquidation. On termination, the employer will have to pay compensation costs if he terminates for his own convenience or if the contractor terminates because of non-payment. In other circumstances, the employer has the right to recover all additional costs that he incurs as a result of the termination from the contractor and to withhold any payment that is then outstanding as well as retain the contractor’s plant and equipment on site. There is also scope for the employer to suspend the contract for a period – and for the contractor to do so if it does not get paid. Clause 14 contains some warranties on the part of the employer which are designed to give the employer some comfort. This clause makes it clear that if any work is it insufficient or defective, the employer can reject it and require the contractor to make good the breach. Alternatively, the employer can refuse to pay for the work. This clause prevents either party from assigning its interest in the contract to a third party without the other’s consent. It also prevents the contractor from subletting all the work, but he can sublet part with the employer’s consent, not to be unreasonably withheld. Designs and documents supplied by the employer to the contractor will remain the employer’s property and must only be used by the contractor in relation to the work. Designs and documents prepared by the contractor for the work will remain the property of the contractor but the employer will have a licence to use them for any purpose related to the project. If there is any third party claim for infringement of copyright, the contractor has to indemnify the employer in full against that risk. There is also a confidentiality provision and a restriction on the contractor publishing any information concerning the project without the employer’s consent. There is a three stage dispute resolution process: firstly, direct negotiation; if that does not work, the dispute can be referred to adjudication. The adjudicator’s decision will be final and binding unless either party objects to it within 60 days. In that case, the dispute will be finally resolved by the English courts. English law governs the contract. This clause covers the issuing of notices under the contract and a number of boiler plate provisions beloved of lawyers. This excludes the rights of third parties but allows for collateral warranties to be obtained from the contractor.